Hmmm, I was going to call out #3 as an obvious set up (12 letter word for girl???) but “mademoiselle” actually fits too … bugger. In the first one, I see what Steve was trying to do, but I’m not sure that qualifies as sarcasm. “What sarcasm” would have been better. Where in the world do they “put down” gay kids? Are those the ones that don’t commit suicide? Oh and what in Pete’s name are bad labels? Fucked up washing instructions? Yeah, the first thing through my (non anglophone) mind was eithanasia. I was a bit put off by the fact that somwhere gay people are put down at birth. Stomabeutel and wandr: “Put down” is a synonym for “make fun of” or “insult” in the US. I’ve definitely heard Brits say it as well, but I do think it might be a predominately Stateside thing. Unless you’re in the States, in which case … you just don’t know a very, very common term. We also use “put down” to mean “kill,” but that’s usually reserved for animals. I personally don’t remember ever having heard that phrase used to apply to humans. In fact, in my dictionary, the only definition offered for “put down” is “a remark intended to humiliate or criticize someone,” with no alternative definitions provided. No mention of euthanasia. Pretty sure that it’s illegal to put down people, hence the uncommon usage of the phrase ‘put down’ referring to humans. Unless you’re the government of a country that practices the death penalty, then it’s all good! i use the phrase “put down” all the time in reference to a human being…I live in America. “To say something about somebody or something in a negative way sometimes in a joke, also known as a cut down.” -as defined by urbandictionary.com. 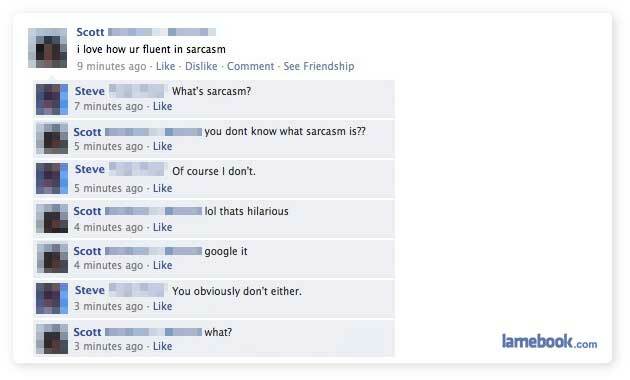 Sarcasm : Intellect on the offensive! love itt!